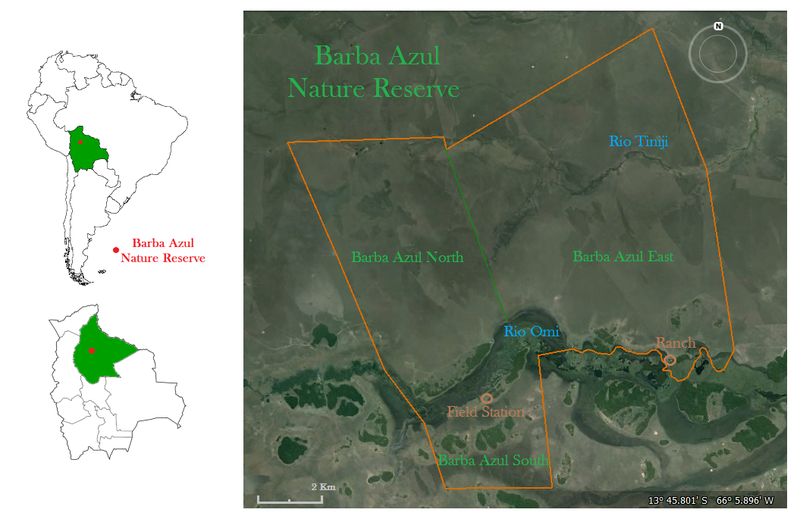 To protect and increase the population of the Critically Endangered blue-throated macaw and other species of the Beni Savanna ecosystem through conservation at Barba Azul Nature Reserve. The Crticially Endangered blue-throated macaw, with a total wild population of fewer than 300 individuals, is found only in the Beni Savanna of Bolivia, where Barba Azul Reserve constitutes key non-breeding habitat, with counts of up to 155 birds (2017). The reserve also protects the Beni Savanna ecosystem in a natural state, protecting it from fires and overgrazing. As many as 1,450 buff-breasted sandpipers (a Near Threatened species) use the reserve on migration, making this the most important stopover site in Bolivia. 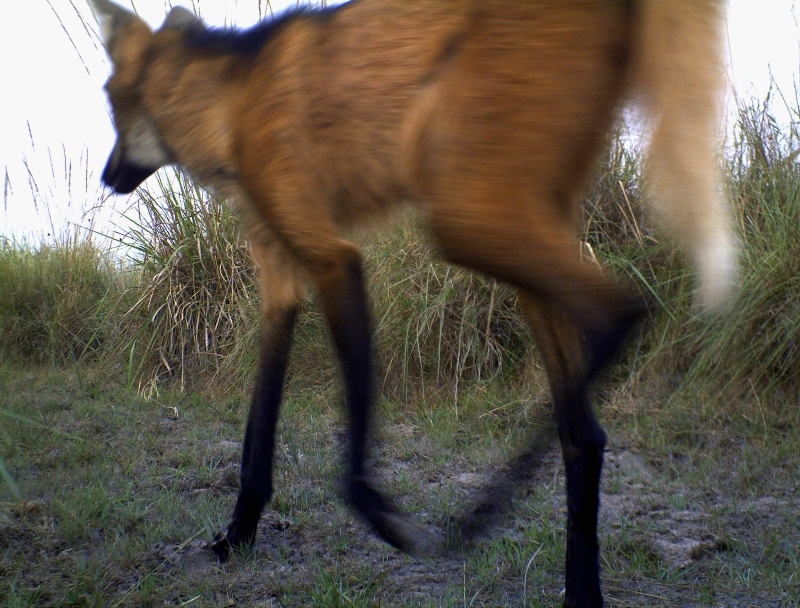 Of its 146 mammal species, several are found nowhere else in Amazonia, including the Beni titi monkey (Endangered), maned wolf (Near Threatened), and the pampas deer. Also present are the southern tamandua, black howler monkey, capybara, jaguar and high concentrations of giant anteater. See our Photo/Video gallery here! The blue-throated macaw and other species sharing the Beni Savanna face ongoing loss of their habitat from conversion for cattle ranching. Fenced portions of the reserve are now cattle free; and a new network of extensive firebreaks prevent the spread of human-caused fires, allowing the savanna ecosystem to function naturally. Palm island habitats provide the macaw's chief food of motacu palm fruits, but some lack regeneration because of cattle grazing. Annual work continues to fence key habitats to exclude cattle and transplant palm seedlings on these islands. Extensive surveys have located new breeding areas for blue-throated macaws outside the reserve under consideration for land acquisition. New improvements in the tourism infrastructure are underway, ugrading qualtiy of cabins, and contructing a new dining facility for reserchers and tourists. Commitment from ICFC in 2018: US$15,000 for reserve management; US$30,000 for infrastructure; US$28,800 for land acquisition. Our field partner is the Bolivian organization Asociación Armonía, which owns and manages Barba Azul Nature Reserve. Other regular supporters of Barba Azul are the World Land Trust, American Bird Conservancy, March Conservation Fund, the Neotropical Migratory Bird Conservation Act program (USF&WS), Cincinnati Zoo and Bird Bolivia. Asociación Armonía is a Bolivian accredited non-profit conservation organization created in 1993. It is supported by the regional governments of Beni and Santa Cruz and the Bolivian national park administration (SERNAP). In 2009, Armonía received a certificate of commendation from the Bolivian government for its efforts to protect Bolivia's birds and their habitats. Armonía manages twenty conservation programs, including twelve programs with threatened species. Key personnel are Conservation Program Director Tjaille Boorsma, Luis Miguel Barbosa, CEO/development director Bennett Hennessey, executive director Rodrigo W. Soria Auza, and Carlos and Yuri Roca, who manage the field station and attend to visiting tourists. The Critically Endangered blue-throated macaw is found in only one place on Earth: the Beni Savanna in northern Bolivia. Extending over 126,100 sq km, this complex ecosystem of grasslands, marshes, forest islands and gallery forest supports a diverse and distinctive flora and fauna. A 2009 survey found 230 bird species, including many waterbirds and several species of North American migrants. As many as 1,450 buff-breasted sandpipers (a Near Threatened species) were counted there recently, making this the most important stop-over site in Bolivia. Of its 146 mammal species (see mammal video, below), several are found nowhere else in Amazonia, including the pampas deer, the Near Threatened maned wolf, and the Endangered Beni titi monkey. Also present are the southern tamandua, black howler monkey, capybara, jaguar and high concentrations of giant anteater. The Beni is entirely privately owned, mainly by ranchers. Much of it is being degraded by overgrazing, planting non-native grasses, and aggressive fire management, as each year more of this habitat is lost to intentional burning for pastureland. The Blue-throated Macaw, whose Spanish name, Barba Azul, means blue beard, was shrouded in mystery until recently. Known from cage birds captured from the wild and from paintings and specimen collections, its range was finally pinned down to the Beni Savanna. There, it depends on palm trees for nesting sites. The macaw faces threats from the illegal pet trade and degradation of its habitat. In particular, the burning of forests kills palm seedlings, resulting in fewer palms for the birds to use for nesting. In 2008, with support from American Bird Conservancy and World Land Trust-US (now Rainforest Trust), the Bolivian conservation organization Asociación Armonía was able to purchase land for the Barba Azul Nature Reserve, creating the first protected area for the blue-throated macaw, whose wild population is believed to number only 350 individuals. The impetus for the reserve was the finding of a thriving colony of at least 80 birds (now numbering about 100), whereas previous surveys had turned up only small groups of 2-3 pairs. The first step was the removal of cattle from the reserve. About 100 macaws pass 6-8 months on the reserve during the dry season, then disperse elsewhere to nest during the rainy season. Nest boxes erected at the reserve have yet to be adopted by macaws, although other species have used them. In the Marban area, Armonia has had success in having this species adopt next boxes, which appears to have led to an increase in population there. We have strong hopes that macaws will start using nest boxes at Barba Azul, which will be a huge step in placing the species on a more secure footing and reducing extinction risk. installation of 4 km of fencing along the entire southern border of the reserve to keep out cattle; installation of 10 new nest boxes for Blue-throated Macaw in the most inaccessible corners of the reserve and access to remote parts of the reserve for other purposes. More generally, fencing has been important, as has having a cowboy on staff at the reserve to constantly deal with invading cattle and cowboys at neighbouring ranches. Nest boxes placed in the reserve since 2010 have not yet been used for nesting by Blue-throated Macaws, but have been used by other species including crane hawk, barn owl, toco toucan and white-eyed parakeets. In 2011, another twenty nest boxes were established for the threatened Orinoco goose. A biological station was established in the reserve to enable continued research, monitoring and protection. Graduate students are conducting a variety of ecological research that will provide a basis for refining reserve management. Ecotourism is being developed, with 141 tourist nights logged in 2015. A small nursery was established and Motacu palm seedlings will be moved from the nursery to newly created forest islands and islands undergoing restoration. Asociación Armonía has reduced illegal trade in blue-throated macaws through education and media campaigns. In 2017 a high-count of 155 wintering blue-throated macaws was observed on the Reserve. A significant portion of the Barba Azul Beni Savannah provides an important migratory stop-over for buff-breasted sandpipers during their annual southbound migration en route for Brazil. Up to 1,450 buff-breasted sandpipers land at Barba Azul to rest and find food after departing Colombia and crossing non-stop over the immense Amazon basin. Our partners at Barba Azul are now actively managing this species' habitat with the aim to protect these birds from disturbance and provide optimal foraging conditions.